pholstery Well as you can see, there wasn't a great deal left here to work from. When I bought the car, everything was upholstered in shiny black vinyl, no pleats, no pockets, no hidem, nothing to add any statement to the bald vinyl. It had been stretched over foam and glued to the side panels and door trim, which in turn had been glued to the timber frames, and traces of glue still remained now; but of the trim itself there was nothing. I had reupholstered the seats myself in tan-coloured vinyl, before they'd had the long rest. I can't now remember what machine I used, and I know I cut corners, not knowing any better, but I thought I'd done a pretty good job of making pleats. 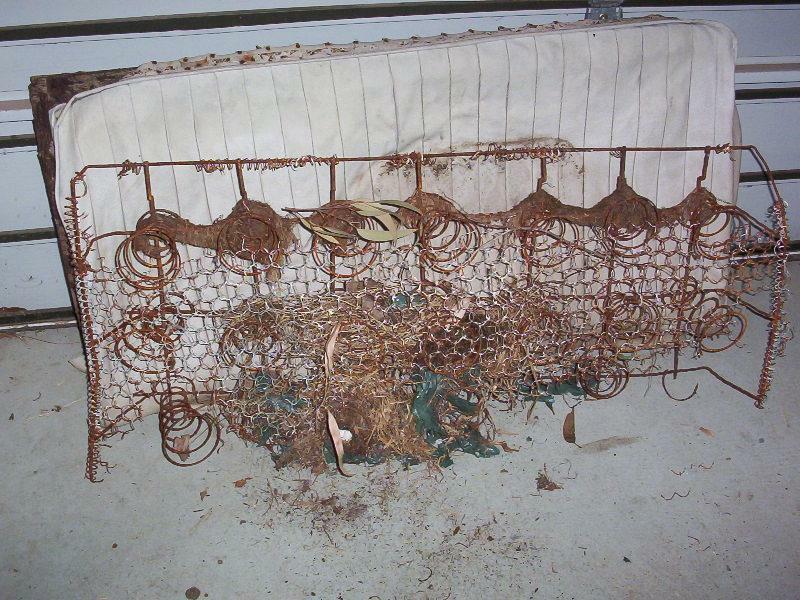 Although it was a long time ago, I thought I remembered pretty well what I'd done, so I was surprised to find that the springs had been stuffed with dry grass, shredded paper, and bits of plastic. And then I realised that of course I hadn't done it, but some little creatures had made their home there, possibly the same ones who had eaten my wiring harness. And so, like so much else, I had to start from scratch. My mate Paul (again) enrolled me in the Automotive Upholstery course at tech, so I had no choice but to go and learn how to do it properly, using a proper industrial machine, with walking foot, for sewing leather. Although back-sewn fluting wasn't in our course, I made enough of a nuisance of myself that the tutor gave me a private lesson. So having done the course, then I had to decide: buy a kit, or do it from scratch. Well, I thought it would be an appalling cop-out if I bought a kit. I was worried about the colour match: the quarter panels are done in vinyl (used to be rexine), while the seats and bits of door trim and pocket trim are done in leather, and I knew I wouldn't be able to match the colours. I thought about using contrasting colours on the quarter panels and piping, etc, but I was persuaded that a couple of shades off would be better than contrasting. But the colour of the leather is different in different lights, and different angles, and the more I looked, the more I was convinced that even kits don't have perfect colour matches. And in any case, I've seen a few cars done from kits: although the sewing is exquisite, yet because every car is different, the kits don't always seem to fit so well. So I decided to do it myself. I thought, if it works, I'll have spent a few thousand dollars on a machine, but saved almost exactly the same amount on the kit, and at the end, I'll still have the machine. And if it doesn't, I can sell the machine for almost what I gave, and buy a kit, and I'm no worse off. And if it does work, I'll have the satisfaction of having done it all myself. Well, I was lucky enough to acquire a machine from a manufacturer who was standardising on a more versatile model. I upholstered the Lotus seats using black vinyl with two different textures, and I think it looks pretty good - better in any case than the seats I bought with the car. So encouraged by this, I set out to upholster the MG. It turns out I made my first mistake right at the beginning, in my choice of material. I wanted a light tan colour to go with the green body, but my supplier had stopped sourcing the standard material. Instead he offered a what he called long-grain material, in the same colour. Now the long grain has some advantage: it looks like leather, but more importantly it can stretch or even be made to shrink a bit, and even quite gross mistakes can be camouflaged to a large extent by the grain effect on the vinyl. But on the other hand, it certainly doesn't look like rexine, which may be a good thing because as far as I can tell rexine has only two virtues: firstly, that it was the cheapest material available at the time, and secondly, that it's virtually impossible to source now. Short-grain vinyl looks more like rexine than long-grain, so if you're looking for originality, its a better substitute. At tech we had been told to use bitumen board for panel trims, but unfortunately none of the suppliers knew what it was. They offered me something called panel-trim-board instead. It looks like heavy duty cardboard, and in fact you could peel it off layer by layer, like cardboard, if you had a wish to do so. I found that it has some advantages, but also at least one disadvantage. It's easy to sew through, and contact adhesive sticks well to it. Its cardboard-like texture means you can shape it around curves by wetting it and gradually bending it to shape. But this is also its disadvantage: its not stable, and that is something of a worry to me - it does seem to me that a sports tourer is going to get wet from time to time. Since I have no choice, I've made the best of it, and screwed it firmly into place, so even if it does get wet, I think it can't move far. I was amazed how much material it took, although conceivably I could have done it all with slightly less. I measured it all carefully, and bought 3.5m of vinyl, and 1 panel-trim board. A couple of days later I went back and bought another panel-trim board, and another 2.5m of vinyl. Out of the first 3.5m, I covered the rear shelf etc, and the side-screen box, and the front and rear quarter panels, plus the hidem banding for the front and rear quarter panels. I made both rear quarter panels, and one of the front quarterpanels, out of the first sheet of trim board, and I made the other front quarter panel trim, plus the two door trim covers, from the other board. It took about 6.3m of piping for the trim that goes all round the car from the dashboard to the rear, and because I hadn't thought this out clearly enough and had cut the 3.5m vinyl, I had to cut three strips from the 2.5m vinyl and make a join on each side. Although this seems unfortunate, yet it let me show off my virtuosity in piping joins. In fact I would have had to make a join anyway, and it would have been right in the middle of the dashboard, whereas now there are two joins, just at the bottom of the doors, and I challenge anyone to find them without a minute inspection. I used just over 1 kg of contact adhesive just for the panel trim and door trims, but because I made a couple of false starts, it might be slightly less, and I imagine if it had been sprayed instead of spread it might have been significantly less. It took 2m of hidem for each of the doors, and a bit under 2.5 m of hidem each side for the front and rear quarter panells combined. Well this top picture shows what we aspire to. 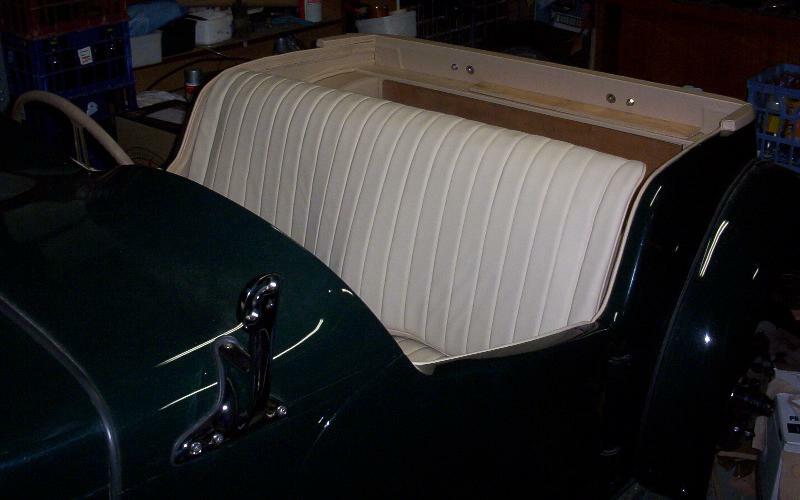 It was made from a kit and sewn by a professional, but even so, you can see that the hidem banding is not parallel to the top of the panel trim; that there is an unpleasant bulge at the front of the Hood Side Rail, where the vinyl cover overlaps itself; and that the panel is not completely round where it joins the wheelarch - and, for that matter, the wheelarch itself is not completely round either (actually, it's a bit hard to see at this scale; copy the pictures and paste into your own viewer). 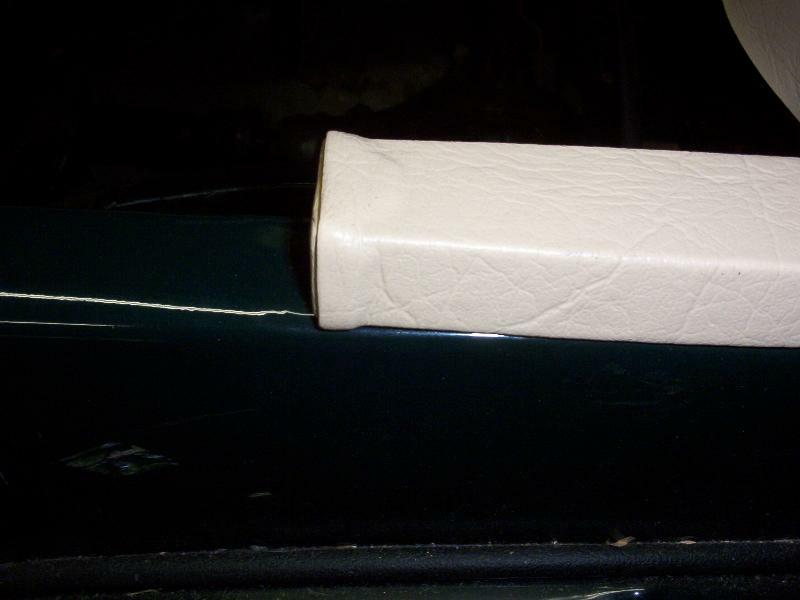 The second picture shows the door trim on the same car. It was sewn from a kit by a professional, and you can see that the shape of the trim doesn't exactly match the shape of the door, at the bottom front corner. Also you can see the difference in colour between the vinyl and the leather trim along the top of the pocket and the top of the door. Also the pocket itself has been stretched too far, and doesn't sit proud as it should. The third picture shows my first attempt at the Hood Side Rail, showing the bulge where the vinyl overlaps the end cover. And the fourth picture shows the solution, a small rebate cut into the end of the timber to accomodate the extra thickness of vinyl. I may have made this rebate just a little too deep. HOOD RAILS The first thing was the timber strip that goes around the back and sides for the hood to screw into (imaginatively called the Hood Back Rail and Hood Side Rails). Now it's possible that this car may never actually get a hood while it lives with me, but just in case, I thought I'd better do it properly. These pieces weren't supplied by Brown & Gammon (they are supplied by the US supplier, but they probably wouldn't have fitted anyway), so I bought a length of Tasmanian Oak 1�"x �" finished; and then I went back and bought the proper size, 1�" x �" finished, and when the timber merchant laughed at me, I lied and said it was for a different part of the same job (actually I was able to use it on the seat back: the seat back is made of 1/4" ply, and to give it strength and reinforcement, a piece of timber is screwed to the top edge). There are a couple of points to note about these pieces. Firstly, the section isn't square: the edges must be planed to match the slope of the back panel and the quarter panel. Next, they're screwed onto the Top Back Rail and Top Side Rail respectively, through the vinyl, then the vinyl is folded up the side, over the top, and down the inside, so the screws are hidden. And because it would be a pity if you tried to fit the hood screws in exactly the same spot where you've screwed these rails, it would be helpful if you made a note of exactly where these hidden screws are hidden. Only the end of the Side Rail is exposed, and must be covered. If you simply cover the ends before wrapping the vinyl over, you will be left with an ugly bulge; but if you cut a small rebate, it will look almost professional. The top picture here shows the process of covering the wheelarch, first with foam and then with vinyl. 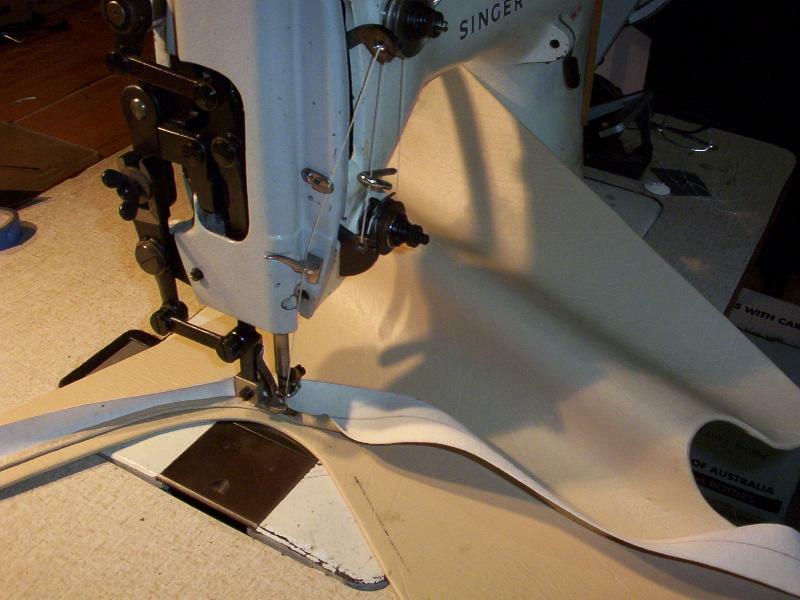 The fiducial marks are to facilitate cutting, sewing, lining up and fixing the vinyl. If you copy and paste into your own viewer, you can probably see how the Side Rail tucks under the end of the Back Rail's cover.The second picture shows the problem with the bolts pulling down into the foam. The third picture shows the quarter panel trim with the two fixes to overcome the problem shown above. The marks on the hidem are wax pencil to show where the screws are, and they will be cleaned off with Prepsol. And with a little massaging, the piping ended up looking much more even. 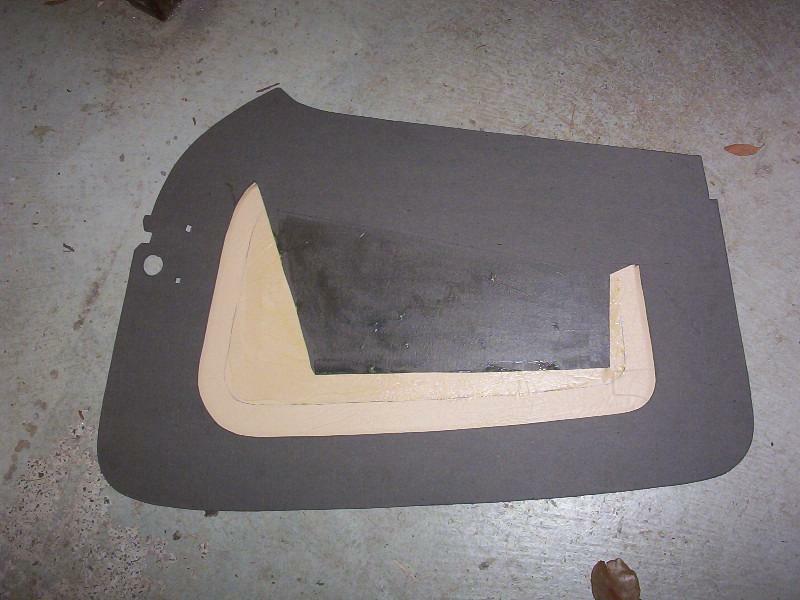 And the fourth picture shows the process of sewing the hidem to the front driver's side quarter panel. 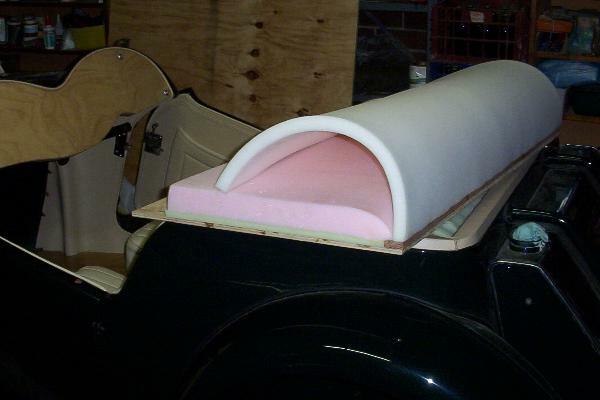 Apart from the process of making and sewing the hidem, which is described below, there are a couple of other interesting points to do with this picture: you can see how the trim-board is shaped to fit around the chassis strengthening hoop, by a patient process of wetting and shaping the board. You can also see that the panel only just fits through the throat of the machine: I found this to be the case in several instances, and its tempting to wonder whether the shape of the panels, and ultimately the shape of the car, might have had something to do with this limitation. And also you couldn't do that in wood! WHEELARCH Next was the wheelarch, which was covered first in 6mm foam. 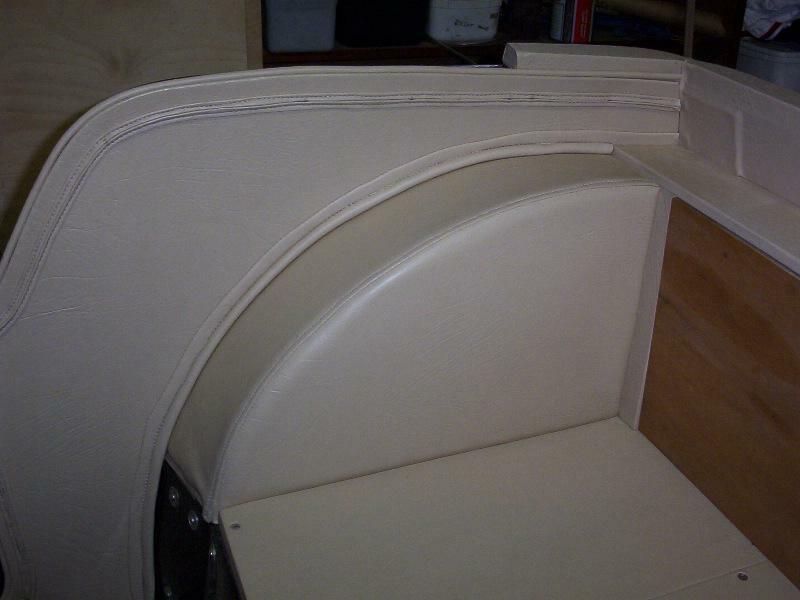 The foam is glued to the metal work, and I took it as far back as the post that supports the side curtain compartment lid, down to the Main Side Rail, as far forward as the tie bar, and in as far as the quarter panel. The fiducial marks on the foam are to facilitate cutting and fitting the vinyl, which I glued to the metal all the way round the foam, but not to the foam itself. Because I had used nyloc nuts and bolts to hold the rear mudguard, not captive nuts as used originally, they also went through the vinyl and helped hold it in place. Then I could fit the covered rear floor boards, the side curtain door posts, and the side curtain compartment top, and finally the rear quarter panel trim, all of which overlapped the wheelarch trim and helped clamp it in place. And here I hit a snag. QUARTER-PANEL TRIM Although I had made the quarter panel trim to fit the wheelarch, yet unfortunately the washers under the nuts which held the mudguard pulled down on the vinyl and underlying foam, so you could see little dimples in the mudguard trim, under the quarterpanel trim, where the mudguard was bolted on. So I thought, what I could do would be to sew a bit of piping on the edge - like a French Welt, but with piping cord. Unfortunately I was too impatient to get some proper piping cord, and I used three-ply laid polypropylene rope, and of course it twisted as I sewed it, and it looked awful. So I unpicked it, and that left an unfortunate row of stitch holes, which I would have to cover. So I used another strip of vinyl to cover the stitch line, and then I made my French Piping Welt, using proper 6mm piping cord from a furniture upholsterer. And I think it doesn't look at all bad, except for few places where the machine got away from me, and even then I think you'd probably pay for it if it had been done by a professional. 1) cut a strip of vinyl 45 mm wide, and long enough to go all the way round the job (for example, 2m for the doors) - you don't want to be trying to make piping joins here. 3) on the panel, mark where the first edge of the hidem is to go, using wax pencil. You don't have to draw a continuous line, but perhaps a dotted line - just enough to be sure where the hidem has to go. 4) fold the first side - the wide side, the 23 mm side - tightly under itself into thirds, so that the folded edge is in line with the "centre-line" marking. Make sure the edge is lined up with the wax pencil guide line, and sew about 1/8" from the edge - use the inside edge of the foot as a guide. Make sure that the material is tightly folded, so that the sew line catches the vinyl all the way along. Sew all the way along in one run. 5) now starting from the same end, fold the second edge under itself into thirds, again folding it tightly, but now letting the edge of the fold overlap the the edge of the first fold by about 1mm, and again sew all the way along in one run. Especially in this second run, do make sure that the material is folded tightly under itself, because if it is loosely folded, the stitch line will miss the edge, and the fold will come undone. Now each half will have been folded into thirds, and the overlap in the middle more or less makes up for what's lost in the sew line, so the end result should be a hidem band which is amost exactly 1.5 cm wide. You may need to practice a bit. 6) now with a small screwdriver or flat blade, run along between the two folded edges and make them lie snuggly against each other instead of overlapping. 7) using Prepsol or some other solvent, remove the wax pencil guidelines. Do try to sew the inside corner first, especially if there is a tight corner to turn, because although you can stretch the vinyl to go round the outside corners, you can't shrink it to go around a smaller radius. In this first picture I sewed in a clockwise direction, sewing the outside edge first, and you can see what happens: the vinyl puckers up and looks dreadful. In fact because there isn't enough clearance due to the pucker, the foot of the machine has damaged the vinyl and it looks even worse. I was unhappy with this whole panel. Luckily I had enough material, so I discarded it and did it again, taking more care. 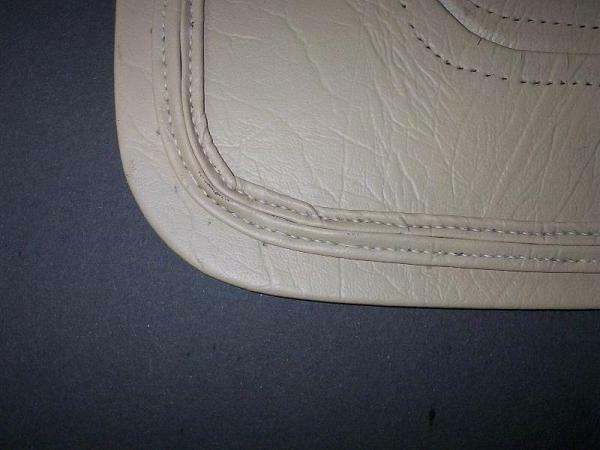 The second picture shows the much better result from sewing the inside curve first. It also shows the match I was able to achieve between the colour of the vinyl and the colour of the leather - you can just see the leather strip along the top of the door pocket, and also the piping along the top of the door edge, which is being sewn in at the same time as the first run of hidem stitches. In fact the colour match is much better in most lights, but something about the flash has shown up the difference. It also shows the wax pencil marking to show where the hidem had to go, worked out by measuring, on the door, exactly where the screws would screw into the wooden door frame, then transferring to the doortrim. It also shows the brain explosion I had while marking out the "centre" line on the hidem - I marked it first a couple of millimetres further to one side, but fortunately realised my mistake before I started sewing, so there are two lines. The professionally supplied material has a thin string sewn in, so that the edges lie smoothly together; but although I did try to incorporate a string, I found it just too difficult. I think my attempt does look pretty good, I think, and I have shown examples from other cars to compare with mine. 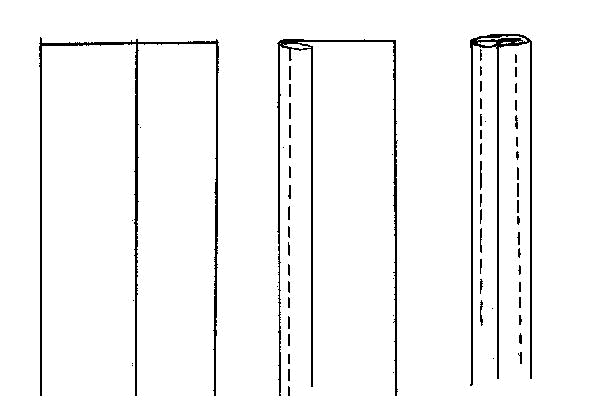 In the examples I have shown, you can't see the string, and the results aren't always better than mine, and sometimes much worse. DOOR TRIM The door trim is more complicated because of the pocket. One of the exercises at tech was to make a pocket for doortrim, and one of the examples was for a TD. Unfortunately the example the tutor chose was the even more antique sort, with a lid and a closure, so I had to work it out myself. 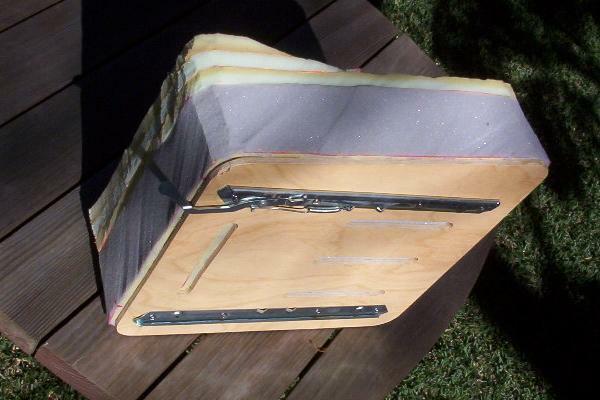 The pocket is sewn behind the door, so it has to make a penetration through the door paneltrimboard. The main part of the door-trim is also folded back through the penetration, to make a nice finish on the outside, and when you think about it, that means there has to be an extra piece of lining (call it the inner lining) to stop things falling through the pocket and into the bottom of the door. This was explained to me by someone who could obviously think more clearly than me, or who had been there before. One of these lines is bound to be the shape of the door pocket. Once I'd decided which one, then I cut a slot about 3mm wide around where the pocket was to be sewn. 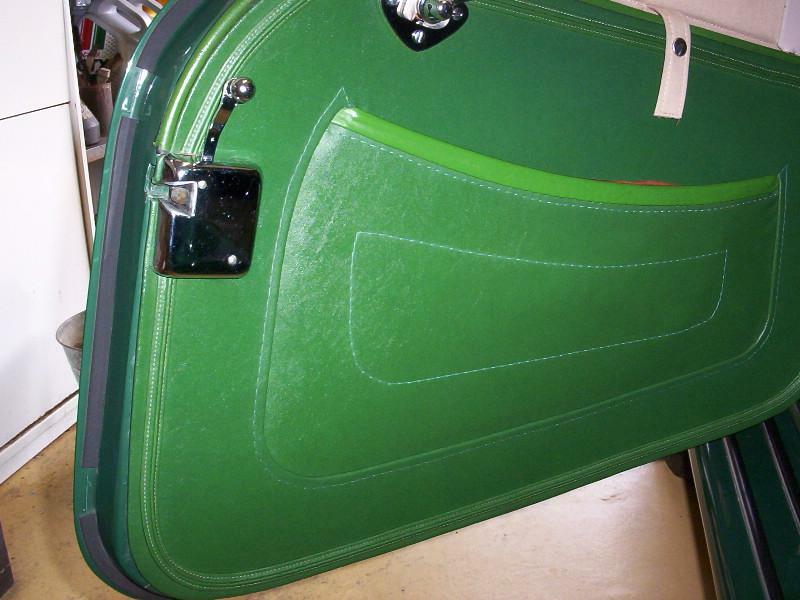 Through this slot had to fit the door trim vinyl, the outside of the pocket, and the outer and inner lining. The inner lining has been glued into place, and threaded through the slot ready to be sewn into place. It doesn't have to go all the way up to the top of the pocket, but only far enough so that it'll be covered by the back of the pocket. Here I've traced the outline of the back of the pocket and applied adhesive ready to fix the main door trim. This is what it looks like from the back. What you can see is the inner lining which has been slipped through the slot, ready to sew. The main part of the trim has been glued to the panelboard, gluing first the back of the pocket, then the top and bottom of the door, then the front and back. 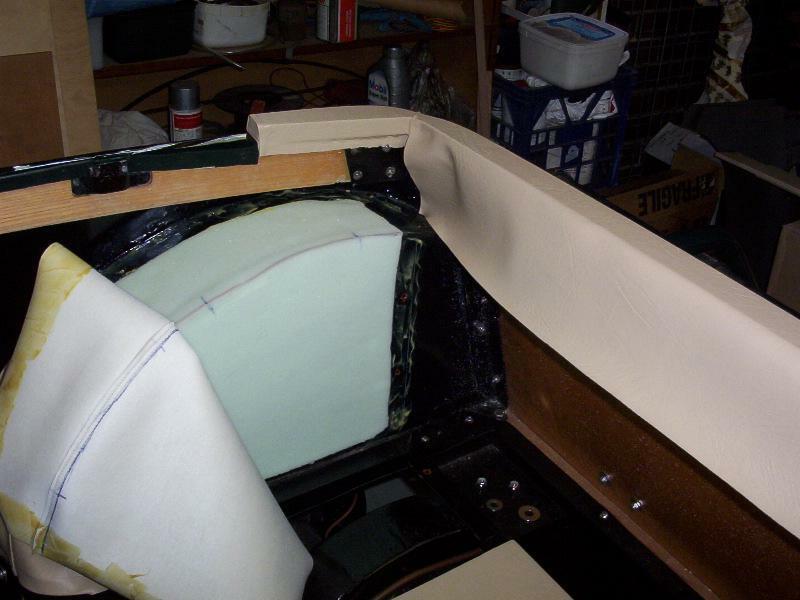 Darts have been cut around the edge of the doortrim, and around the pocket, and the main trim has been stretched over and glued behind. The back of the pocket has been sewn to the inner lining. Do not glue the vinyl to the backing foam. It is impossible to get a good finish, and I think what happens is that the adhesive makes the vinyl expand, then when it dries it puckers. Alternatively, when the vinyl is offered up to the foam, the foam is distorted and the vinyl is glued in the wrong place. Better not to know. Finally you can see the pocket has been sewn, and the leather strip sewn at the top, binding together the outside and the the outer lining. The pocket has been threaded through the slot and sewn from the back. An extra piece of trimboard has been sewn on the back to support the pocket and give it profile. So first, cut the door paneltrimboard to fit the door. 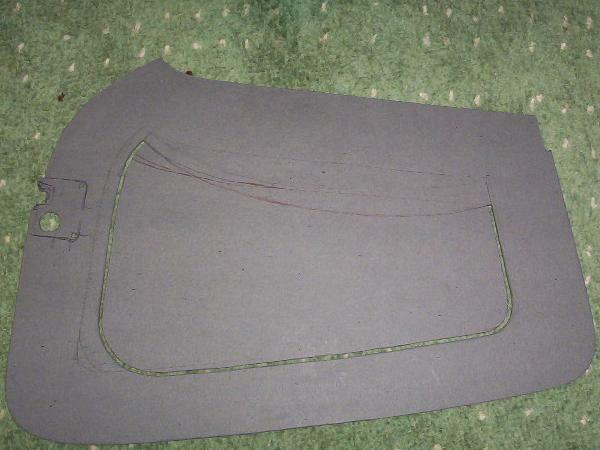 Then work out what shape the pocket will be, make a template and transfer it to the door. No two MGs that I have seen have quite the same shape; so I think you're pretty well free to make it how you will. I started off making it equidistant from the edge of the door, all the way round, but that meant the bottom corners had a very small radius, while the shape at the top was almost flat. So I made what I think is a nice compromise. In the picture, notice the cutout at the back of the door: a piece of leather piping runs along the top of the front edge of the door, from the top of the door lock, along the top of the door, and down to the top of the top hinge, so although you can't see it except at the back, the cutout does in fact run all the way around the top of the door to accomodate this piping. Next lay out and cut the vinyl cover trim, leaving about 2.5 cm all the way round to fold over and glue on the back. Turn the workpiece over, and mark on the back of the vinyl, through the slot that has been cut, the shape of the pocket. Now remove the vinyl, and mark and cut about 2.5 cm inside the line of the pocket, so the vinyl can eventually be folded back underneath to cover the edge. The tongue-shaped piece will be the back of the pocket. Now the extra piece of lining (inner lining) can be added, which is going to be big enough to be covered by the back of the pocket on one side, and big enough to go through the slot on the other and overlap by about 3cm, where it will eventually be sewn. This piece needs to be glued to the paneltrimboard on the right side, but left unglued on the back of the door trim, because the main trim will be folded back through the same slot, and the pocket will also be threaded through. Now the main part of the cover trim can be glued to the paneltrimboard. I found it easiest to glue it in sections, first the back of the pocket, then the top and bottom of the the door, then the front and back. So that I only glued where it needed to be, I laid the it over the door panel, and drew, on the inner lining piece, around where vinyl had been cut for the pocket. Once the main part had been glued, then I cut the darts to allow the edge to be folded back under the edge of the pocket, and folded and glued them. And as a final step in this phase I sewed all around the edge of the back of the pocket and the inner lining, so there was no possibility that it might become unglued. The pocket itself consists of two pieces, the pocket cover and the outer lining, sewn together through a layer of 6mm foam. The cover and the outer lining need to be about 3 cm bigger than the pocket, to allow them to go through the slot to be sewn on the back, but the foam needs to be exactly the same size as the pocket - no bigger, but certainly no smaller. The sew line needs to be parallel to the edge of the pocket for best appearance. Do not glue the vinyl to the foam, because it looks like crimplene: I think what happens, the glue lets the vinyl stretch a little, then when it dries, it shrinks again, and makes the underlying foam pucker. The top of the pocket is sewn with a leather edge - a french welt. The front, bottom, and rear of the pocket are left unsewn at this time. So now you're in a position to slip the pocket through the slot in the paneltrimboard, ready to sew. But before sewing, think about the profile of the pocket. The foam is obviously included to give shape and profile to the pocket. If it simply sewn at this stage, there is nothing to hold it proud at the edges, and indeed on most of the MGs I have seen the pocket simply fades into the doortrim panel. I cut a supporting piece of paneltrimboard to go around the edge of the pocket at the back, and sewed it to the back of the pocket, then slipped the pocket through the slot, then sewed it all together with the final row of stitches. 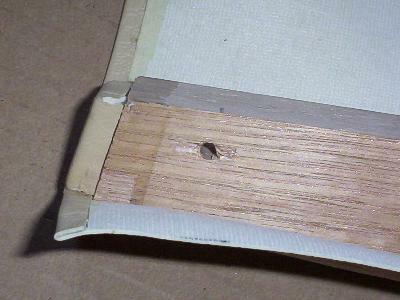 As well as being decorative, this final row of stitching sews together, in order from the front, the main part of the doortrim, the trimboard itself, the part of the main doortrim vinyl which has been folded back under and glued, the outside of the pocket, the outer lining of the pocket, the inner lining, and the final supporting piece of paneltrimboard. This gives support to the pocket, and helps keep it shape and profile, standing proud from the doortrim. I think it looks great. And finally, of course, the hidem, as described already. FLOOR BOARDS AND SEAT SLIDES. First of all, if it's not already fitted, this would be a good time to fit the speedometer cable, which I found to be impossible to fit when the floors were in place. If you read the bit in the engine section, it will of course already be fitted to the gearbox. In that case, it only remains to thread it up through the firewall and connect to the back of the speedo itself. Malcolm Green shows a diagram of all the penetrations in the firewall, and he says the speedo cable should go through the same hole as the wiring cableform. I think that is extremely bad practice, and also there wasn't enough room, so I made another hole adjacent to the wiring cableform. Mea culpa. I also made up a cable clamp to hold it in place against the firewall, as Green specifies. Having sorted that out, and turning now to the floors themselves, I made up a template for the floor boards, using a mosaic of small bits of cardboard to turn the complex corners. Then I stapled the bits together, and transferred the mosaic to a single sheet of cardboard for a final fit check, before transcribing onto the floor boards themselves. I used 15mm builders ply, which has one good side and waterproof glue (same glue as marine ply, I'm told). I did my best to cut the bevels correctly, but somehow my $15 jigsaw defied my best efforts, and all the bevels came out straight, which was disappointing. When I fitted them up with the prop tunnel and gearbox cover, it was clear why my mates advised me to use 1/2" ply: there was a gap between the gearbox cover and prop tunnel which would not pull down. The prop tunnel fits underneath the floorboards, while the gearbox cover goes on top; so unless the floor is the right thickness, naturally it won't fit properly. In the end I routed out a rebate for the gearbox cover, and now it fits beautifully. I primed the bottom and edges with marine primer, and painted them with matt black oil-based paint. I varnished the tops, although of course they'll be covered with carpet, and they do look pretty good. I couldn't source proper seat slides, which was probably a good thing because they were more than three times the cost of what I ended up with: slides from an MGB. And I could only get left-hand slides. The runner is a bit longer than TD's, and its not hinged at the front but designed to be bolted firmly to the floorboards. I toyed with putting a hinge on, to facilitate removing the seats; but I don't remember ever taking the seats out when the car was in daily use (in fact, since writing this, I have taken the pasenger seat out, to fix the "collapsing sides" problem; it took just over one hour, including removing the gearbox cover, which itself involved loosening the bolts holding the remote gear lever cover to give enough clearance, and removing the floorboard entirely with the seat still in place. I didn't have to take out carpets, because I still haven't made them). Also I toyed with drilling out the rivet and reconfiguring one of the slides to make a right-hand slider by putting the adjusting lever at the other end: all the holes are drilled for symmetry. But of course the adjusting lever is bent differently for left and right, and I'm not sure it would have had enough clearance from the runner to be able to disengage from the adjustment holes. I suppose I could have just reversed the sliders on the driver's side, so that the flange would have gone the other way (bending outwards instead of inwards), and the lever would have been on the proper side; but then the lever would have worked in the opposite sense, which would have been confusing; and it would still have looked wrong. So I'll just have two left-hand runners, and the driver's side will have its seat adjuster adjacent to the tunnel instead of adjacent to the door. For them to work safely and effectively, the slides must be manufactured to quite tight tolerances and must be fitted properly. So I took exquisite pains over measuring and fitting, to get them parallel with just the right clearance - about 1/32" - at each end of the slides. So I was disappointed to find that one of the seats jammed instead of sliding freely. And I was even more disappointed that it took me so long to work out what the problem was: my retailer had sourced the floor sliders from two different suppliers, and only one set worked remotely well. The other set was made from much thicker material, and when finally I measured the whole length of the track, I found there was a bow in the centre of each of about 1/4" - about eight times what I thought would constitute a reasonable fit. Judicious use of a vice and hammer straightened this out, and the runners worked much better, but still not as well as I would have expected. I eventually worked out that the new problem was the seat sliders: the edge is folded back over itself to fit over the flange on the floor slider, and it had been folded too far. Well, it didn't take long to make up a tool to lever it back into shape (in fact I already had the tool - a broken screwdriver) and now they work acceptably well. But how disappointing that these expensive fittings don't in fact fit as supplied! SEAT SQUABS. I transferred the dimensions as well as I could from the wreck of my old seats. As far as I could tell, the seats were roughly trapezoidal, the front and back edges being parallel to each other, the inside edge perpendicular to the front and back, and the outside edge tapering towards the front to match the shape of the body (my dictionary says that a trapezoid is a quadrilateral with no two sides parallel, and careful measurement revealed that my old seats were in fact trapezoids according to that definition; but I'm sure that the front and back should have been parallel). The seats were about 19" long (front to back), 15 �" wide at the front and 17 �" wide at the back. 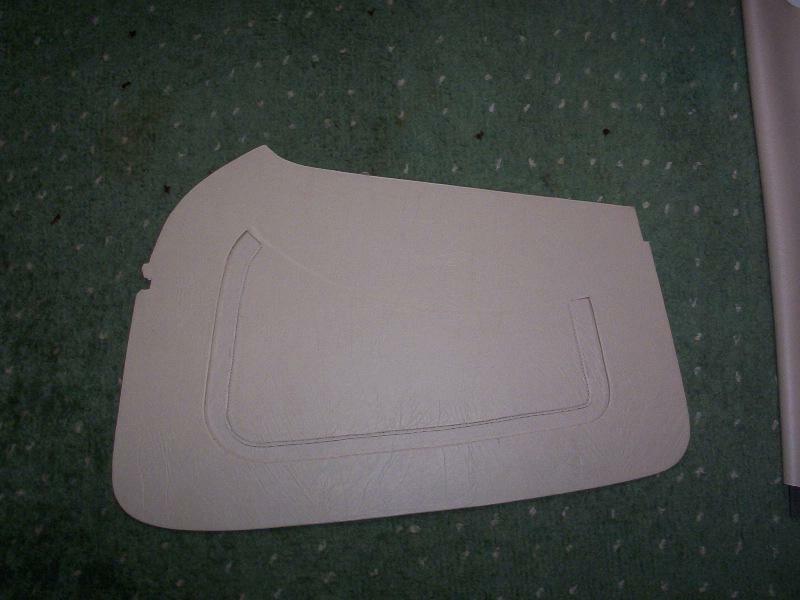 Anyway, from the trial seat I found that it was best to make a lamination from different grades of foam. I ended up with a 4" cushion of 35/200 foam, with a 1" lamination of 29/200 and the wedge made from 2 laminations of 1" by 29/200 (the first number - 35 - refers to the density of the foam, and the second - 200 - refers to the hardness. 29/200 was too soft to be used alone for the seat squabs, but was too hard to be used alone for the seat back; 29/400 was extremely hard, good for packing instruments etc, but no good for seats; 35/200 was too hard to be used alone for the squab, and too hard to be used at all for the back). The lamination gave a very pleasant feel, soft enough to sink in a bit, but then firm enough to give good support. 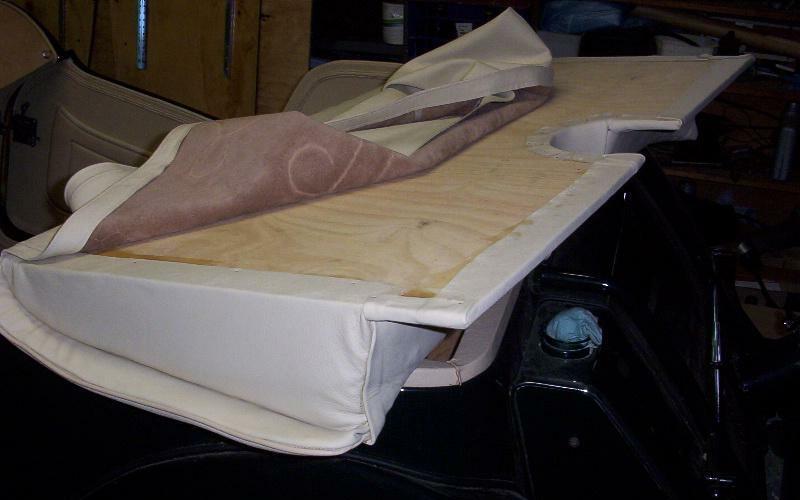 In the picture you can see the passenger's seat, showing the different laminations glued onto the plywood base, you can see the breather holes in the base, and you can see the runners. What you can't see is that the wedge was first glued onto the back of the seat, not the front, and you can't see the Tee nuts let into the base for the seat hinge, because I forgot to put them in and then had to rip off the foam in order to fit them properly. Sewing the pleats take patience, but is not difficult. I cheated, because instead of the traditional back-sewn and stuffed, I used back-sewn through 12mm foam, which is easier and looks the same. First work out how big the leather must be: for my seats, 17 � " (445mm) at the back by 19" (483mm) long, I allowed 20 mm seam allowance all the way round, and 12mm for each pleat, so with seven pleats I calculated 569mm wide by 523mm long, and because I don't trust myself I cut it a little larger than that. Notice that because of the allowance for pleats, the leather as cut is wider than it is long, although of course the seat is longer than it is wide: don't be confused about this and sew the pleats the wrong way round! 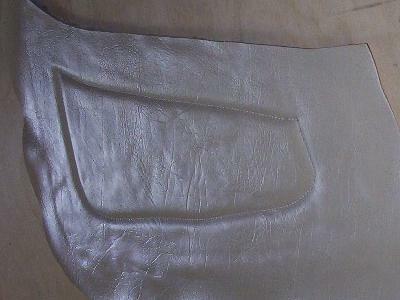 Because of the tanning process, the leather looks different from different angles, even in the same light. 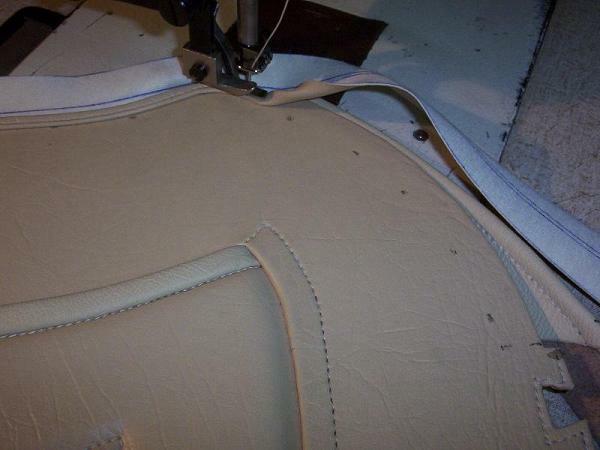 So cut the leather for the second seat at the same time from an adjacent area, and mark both pieces so you end up oriented the same way round (in the picture showing the pleats being sewn, notice how I have marked "Back", in wax pencil, on what was in fact the side. Not a problem, because I realised in time what I'd done wrong). Now work out how big the backing foam must be. 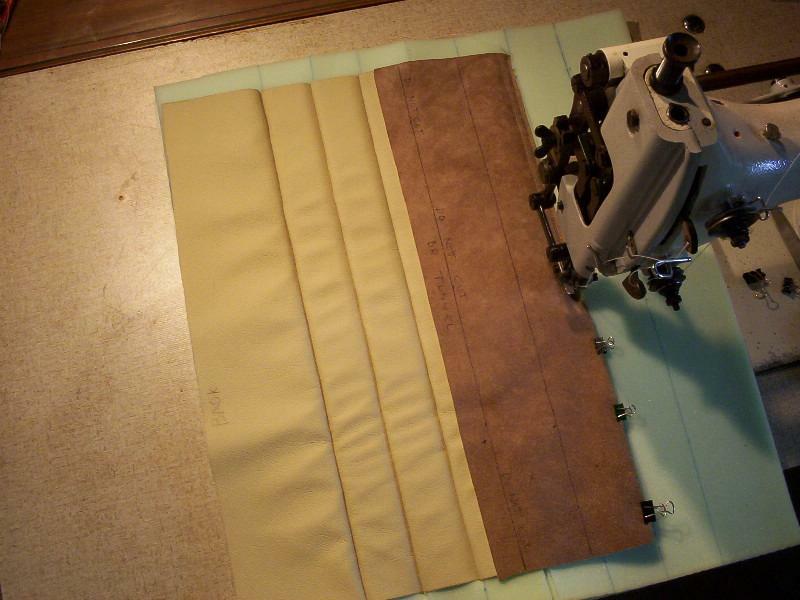 Allow the same seam allowances (20 mm), but only 6mm for the pleats. Be generous, because the foam and the calico are cheap compared to leather: add another couple of cm all the way round! Now glue the foam onto the calico backing. Now mark the leather and the foam, remembering the sewing allowance for the seams, and, for 2" (50mm) pleats, marking the leather at 2�" (62 mm) and the foam at 2�" (56mm) (or even 53mm). Cut about halfway through the leather, from the back, and about halfway through the foam, from what will be the front. Do not cut all the way through to the calico, but if you do end up cutting all the way through the leather, it's not a major problem, because you're going to sew the edges together anyway. Work from left to right, as the picture shows. 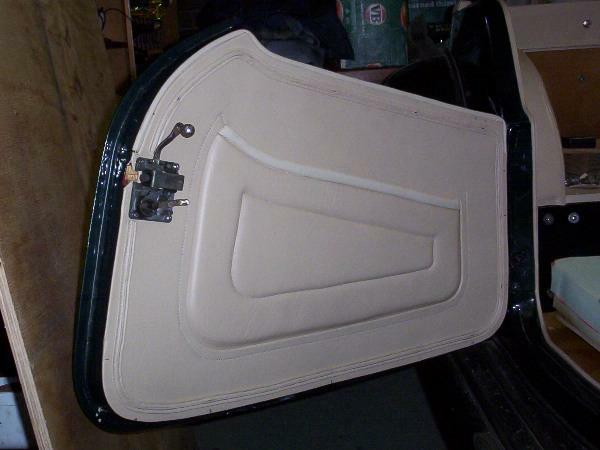 This cover was to be the driver's side, and I sewed from the the door side towards the transmission tunnel. I found it easiest to clamp the edges of the leather together, even when I hadn't cut all the way through. Now line up the edges of the leather with the marked and cut foam, and sew about 3mm from the edge (for convenience, on my machine the foot is about 6mm across, so 3mm is the distance from the needle to the edge of the foot; so line up the edge of the foot with the edge of the leather, and take it easy. Once the flute is sewn, fold the leather over, and inspect the flute from the top: you can still make changes at this stage, but once you've sewn the next flute, it's practically impossible. So when you're happy with the flute, fold the next pleat over, clip the edges of the leather together, line it up with the cut edge of the foam, and sew the next flute. Repeat as necessary. For the other seat, the passenger's seat in this case, remember to orient the leather in the same direction. Because the flutes aren't exactly symmetrical, turn the work-piece through 180 degrees, and again sew from the door opening towards the transmission tunnel, inspecting each flute carefully from the top before moving on to the next flute. Do pay attention to the presser foot pressure, because there is much more friction between the leather and the foot than between the calico and the dogs, so it would be easy to sew some twist into the flutes. Mark the outline of the seat onto the top of the flutes, using wax pencil: I used the same cardboard template I had used to mark the plywood base and the foam. Sew the piping onto the flutes, lining up with the wax pencil marks and remembering to start from the back corner, and sew the side, front, and other side (if you start from the front corner, you'll find that you've sewn the side, back, and other side; in that case, remember, as I've already said, that it's easier for right-handed people to unpick from left to right). The back edge doesn't have piping, but does need to be sewn anyway. Trim the listing to about 1 cm, and rip out the excess foam from between the calico and the leather. In the first picture, you can see that I did manage to get the piping in the right place. You can see the boot seams on the front of the skirt, and you can see how well they line up with the first and last flute seams. In the second picture, you can see how well they line up with the runners, with the result that the runners have to clear three thicknesses of leather, not one, and there is just not quite enough clearance for them to run freely without fouling the cushion cover. You can see the hinges for the seat back, bolted into Tee-nuts let into the plywood, and you can see the brass tacks fixing the leather to the plywood, and that it wasn't necessary to cut darts. 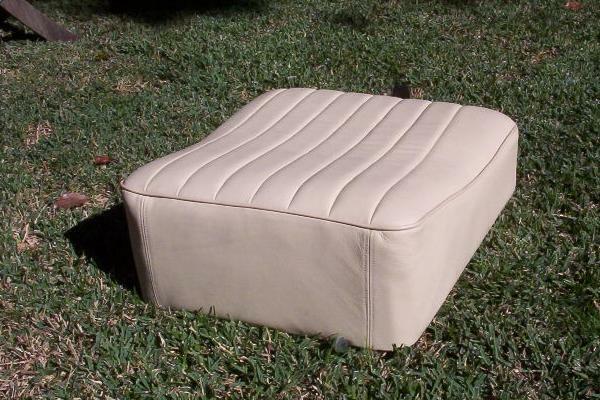 Now offer up the skirt to the foam cushion, and mark the top edge. Originally the skirts were made from one piece of leather and one piece of rexine: the rexine was adjacent to the tunnel and round the back, where it couldn't be seen easily. Most MGs these days use only one piece of leather which wraps all the way round. I used four pieces, because I like the ornamental boot seam you can sew in when joining pieces, and also because it meant I could use smaller pieces of leather. Trim to about 1 to 1.5 cm from the marked edge. I left about 2" at the bottom to turn over under the plywood and tack to the base. Think carefully about front and back, and sew the skirt to the piping along the marked edge. 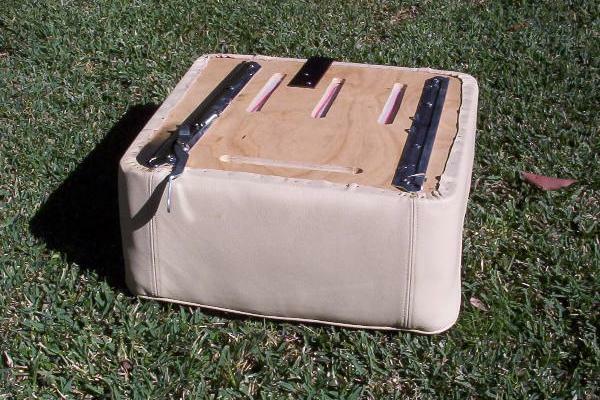 Fit the cover to the cushion, turn it over, and tack it to the plywood base. Although I was prepared to cut darts to facilitate this, I found it wasn't necessary: there is enough flexibility in the leather to go round corners without. Staples are easy to use, but they will rust: I used brass tacks. SEAT BACK Now the seat back was originally made on springs, like bed springs (see first picture in this section), but because a spring set is expensive and hard to source, I made mine on foam. I do worry that it might be a little hot and sweaty in Australia's climate. It isn't meant to be completely flat, although many of the MGs I've seen do have flat backs. The top edge is straight, but the bottom is shaped to provide a little lateral support. When you think that through, it means the bottom edge of the flutes must be longer than the top edge, and in fact I found, by stretching out the old cover, that it was 39�" (100cm) along the top, and 42" (107cm) along the bottom edge.That means the flutes aren't parallel, but tapered wider towards the bottom. I wanted 2" pleats, to match the seat squabs, which meant 20 flutes, plus the two "wings" which fill the gap between the seatback and the side of the car. So I had to mark the flutes at 2�" at the top, and 2 5/8" at the bottom - not much, but 20 times 1/8" = 2�". And this was made a little more complicated, because I wanted to sew the flutes, not from left to right as I had done for the squabs, but from the centre outwards, in order that the shape of the flutes should be symmetrical. So that took just a little more thought in marking out the centre flute: you have to allow the �" (12mm) seam allowance twice for the centre seam. And after all that careful calculation and measurement, somehow what I ended up with was 39" along the top, and 41" along the bottom. I can only think that in fact I used more than 3mm calculated for the sewing allowance. 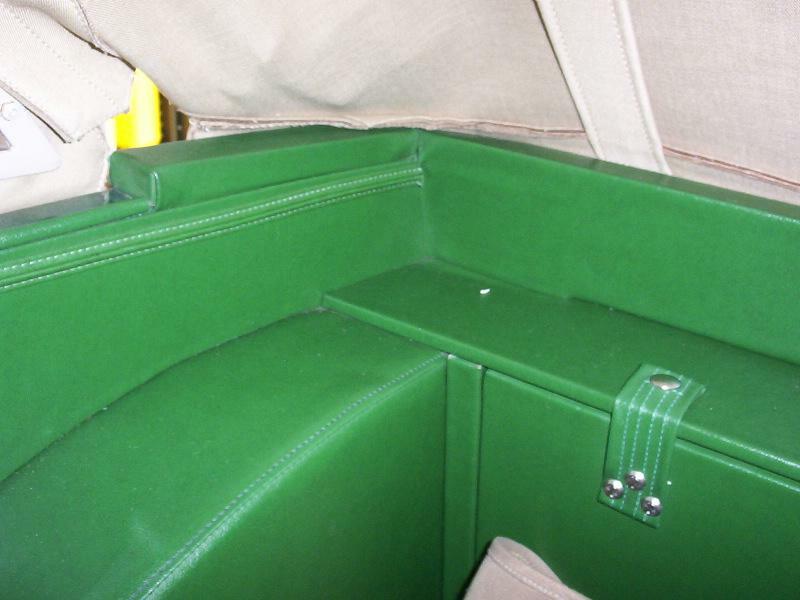 And here is shown the seatback, sewn onto the pleats at the top, and fixed to the back board with brass tacks. Like the seat squabs, I made the back with a lamination of foams of different grades. When you lean back, there is much less weight on the foam than there is on the squabs, which are taking all your weight. So the foam needs to be softer. I made mine from �" of 29/200, then 2" of 30/110, then 1" of 25/60, and it feels like the height of luxury. I made the lateral support from the pieces left over from making the wedges for the squabs. To get the nice rolled top I glued the edge of the foam, layer by layer, then folded it down and glued to the back. 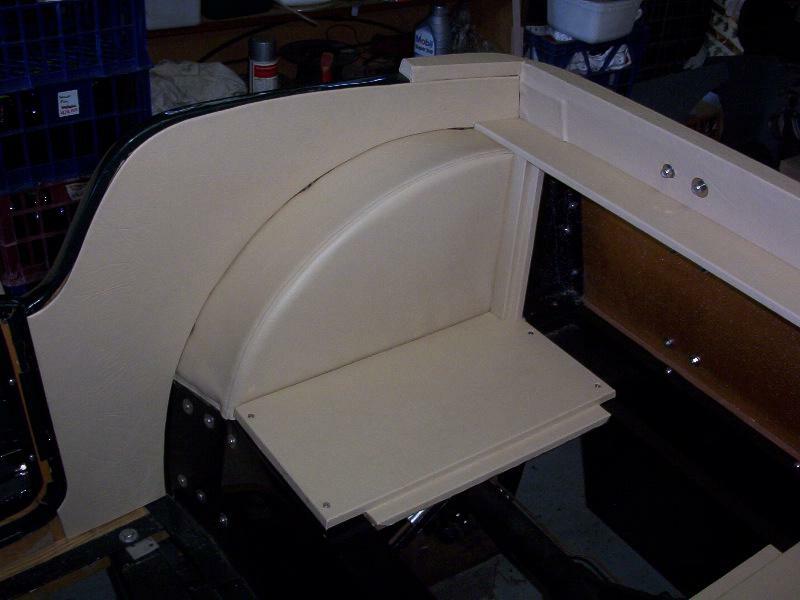 I thought I could be really clever here: because the seat back inclines at an angle, I thought I could trim the foam at the bottom at a complementary angle, so that the seat back would fit exactly against the squabs. Unfortunately I trimmed it at the opposite angle, so that instead of fitting exactly, it was worse than if I'd left it at right angles. The flutes were sewn exactly as for the seat squabs, except that I sewed from the centre seam towards each side, so that the seams would be symmetrical, and any twist (arising from too much foot pressure) would be the same each side. The side wings were thought through: each wing has to be in two parts, one which covers the side of the seat, and one which covers the back of the flutes. Mark them out carefully, allowing 1/2" for sewing allowance. Piping goes all the way round the top and sides of the flutes: I sewed this next, then pulled the excess foam out of the listing so that it would lie flat when sewn. Then I sewed the "wings", the little flaps that cover the back of the flutes, onto the piping. Then I offered it up to the seat, and marked and cut the side pieces. The side pieces, and the back of the wings, and the flutes, are all top-sewn together: obviously you have to be careful to get the right shape at the top of the side piece, to match the curl of the flutes as they go over the top of the seat. You have to get the tension in the leather right, because otherwise the back of the wings will be too loose, or else it will be pulled out of shape. I got one right, but the other is a bit of a disappointment, being too tight. Also I found it very hard to get the top-sewn seam straight. Next I cut the back, making it about 2" oversize, and sewed the edges under with a double seam to make it exactly the right width. Originally the seat back was rexine, but I used leather, because I had leather left over but not enough vinyl. To prevent stretch from being a problem, because I'd sewn the back to be exactly the right width, I clipped it onto the piping with bulldog clips, then sewed it onto the flutes. 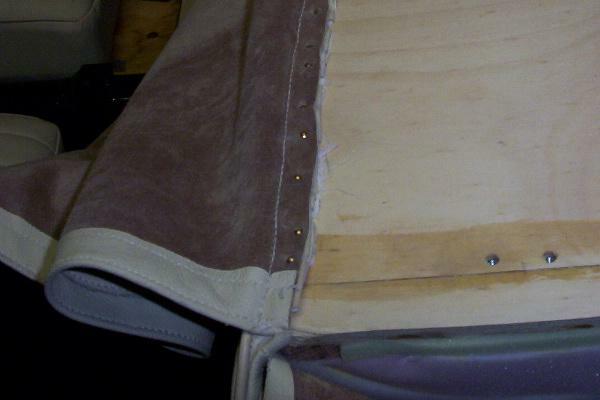 Then I sewed the cover for the bottom edge of the seat, and the bottom board cover. Once again these would have been rexine in the original, or vinyl in more modern copies, but I used leather because of availability. At this stage I should have sewn the side pieces onto the bottom cover, but I thought (wrongly) that I could sew it later; consequently this seam is glued, but because very little stress gets applied here it probably doesn't matter. There are a couple of problems which I found around here. Firstly, although the body is wider than the TC, the seats are not: they were designed for narrow postwar bums, not the slightly more substantial millenial bums. If I had thought of this, there would have been plenty of room to make them about 1" wider on each side; but I didn't, and to remake the seats is a bigger ask than I'm prepared to contemplate. And you can see the second in the picture above where Margaret is trying it out: the centre of the seats, where you sit, gets some support from the sides. But there is nothing to support the sides: consequently the side compresses more than the centre, and you kind of slide off sideways. 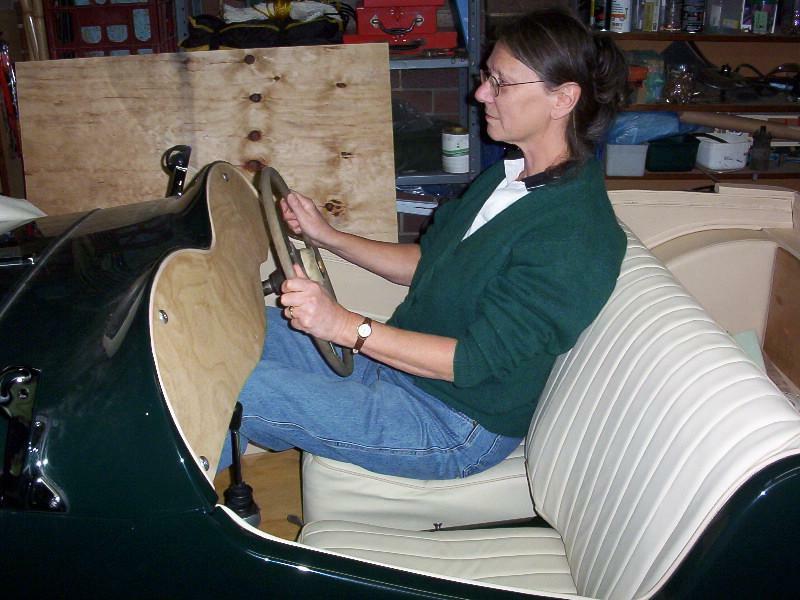 This is not such a problem for the driver, who has the steering wheel for stability (and also in my case, a narrow postwar bum); but it is a problem for the passenger, and Margaret complains bitterly, especially since I haven't given her a grab handle and I discourage her from grabbing onto the bodywork with her ringed fingers. 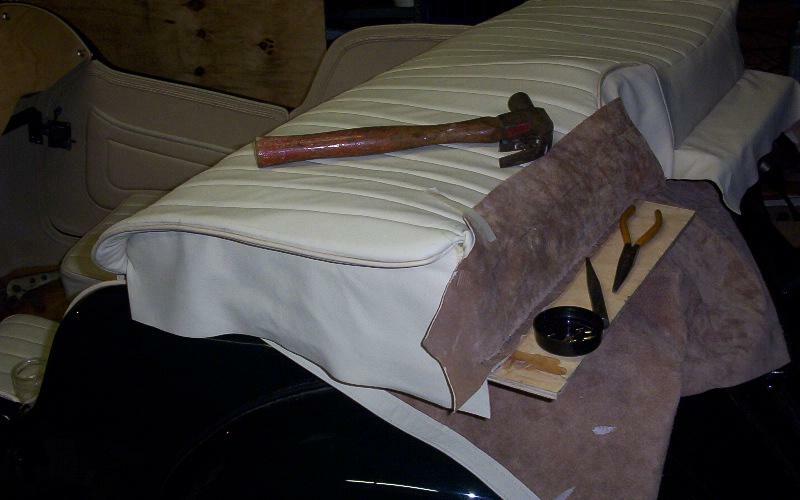 The fix was to strengthen the sides, by taking off the cover, cutting away some of the soft foam and replacing with firmer foam. After discussion with the supplier, I used a 2 inch strip of 29/400 on each side. Certainly the seat is much firmer now, with no tendency to roll off the side, but I could have used perhaps a 1 inch strip, or perhaps a slightly softer foam. My supplier of brass tacks had gone out of business, and I couldn't find an alternative supplier, so the cover is fixed on with blued tacks, which will rust in time. But I expect that the upholstery will have been done again by then, supposing that the car survives.